The unique combination of healthy antioxidants, electrolytes, and natural caffeine in our premium coffee fruit teas is the best way to boost immune function, stay hydrated, and keep energized. The best part? No caffeine crash, just energy that lasts. 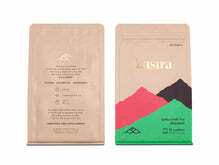 Our KASIRA™ 18-count pouches contain 18 individual servings of premium fruit tea in convenient, 100% biodegradable tea sachets.